This Padmini PTC 2000 AT 2 Heat setting 1000/2000 Watt Room Heater. It comes with PTC ceramic heating element Indicator light and Automatic power off in case of tip over. 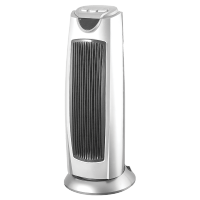 This room heater is Automatic overheat Protection with 900 angle oscillating wind. To Recieve updates and possible rewards for Padmini PTC 2000 AT please sign in. To Recieve updates and possible rewards for Room Heater please sign in.